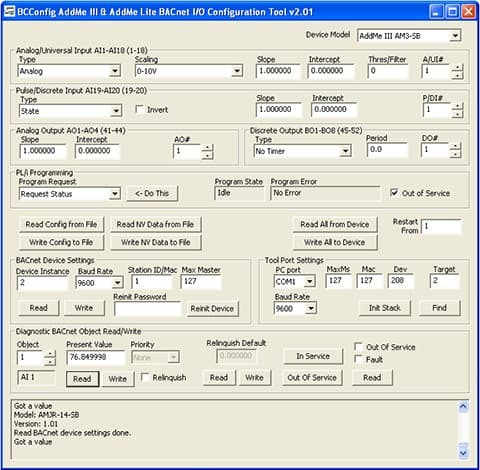 Control Solutions’ AddMe III Model AM3-SB Programmable I/O for BACnet MS/TP is a BACnet Application Specific Controller (B-ASC) with 32 I/O points and programmable control. The AM3-SB features 18 analog/universal inputs with configurable type and scaling. You can individually configure each universal input for high resolution analog, fast analog, or discrete input. When configured as an analog input, the continuously self-calibrating sigma-delta converter produces 15-bit resolution with high noise immunity. When configured as a discrete or fast analog input, the converter switches to 10-bit resolution at 128 samples per second for fast response. All I/O points are accessed as BACnet objects (AI, AO, BO). The AddMe III a;sp features 8 discrete outputs with Form A dry contact relays and HOA switches, 4 analog outputs sourcing 4-20mA, and 2 discrete inputs with pulse count capability to 5kHz. 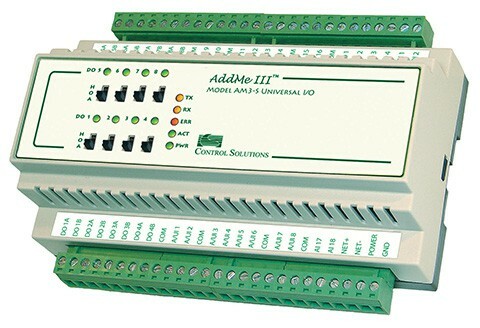 Control Solutions’ AddMe III features 18 universal inputs which are context sensitive. When configured as an analog input, the continuously self-calibrating sigma-delta converter produces 15-bit resolution with high noise immunity. When configured as a discrete input, the converter switches to 8-bit resolution at 128 samples per second for fast response. All I/O points are accessed as BACnet objects. 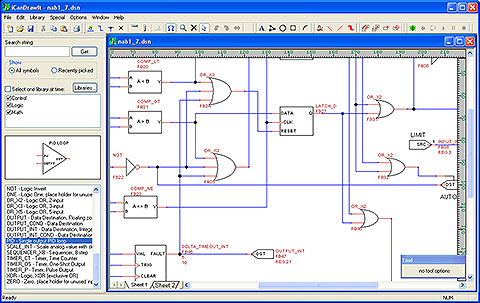 Analog Input objects provide data from the analog I/O points. Linearization tables are provided for 10K and 20K type II, III, and IV thermistors. Input type and scaling is configured by writing to object properties. Analog and Binary Output objects provide BACnet access to the outputs. An additional 60 writeable Multistate Input objects are available for use by the user's program. The AM3-SB configuration tool connects to the MS/TP network using the MTX002 MS/TP to USB adapter (if not using a BACnet IP router). This intelligent adapter plugs into your PC's USB port, and offloads the MS/TP token passing from the PC to make it more reliable. The MTX002 allows you to connect your PC to an MS/TP network running at 76800 baud, something not possible with a generic RS-485 port adapter. The MTX002 functions as an MS/TP device itself. The combination of the MTX002 and configuration tool running on your PC will appear on the network as a discoverable BACnet device. The diagnostic section in the configuration tool can be used to read and write any objects in any MS/TP device on the network. The configuration tool provides a template for reading and writing the multiple properties per BACnet object that define its configuration or client/server mapping. All configuration parameters exist as properties of BACnet objects which are accessible to any BACnet client. The Control Solutions configuration tool simpy provides a user friendly template for accessing those properties. The AM3-SB Configuration Tool is a user friendly configuration tool that provides a simple template for assigning the BACnet object properties that configure the device. Connect the AM3-SB to your laptop via a USB to MS/TP adapter (MTX002) or via a BACnet IP router.